Prior to founding Bristol Woodworks, owner David King spent 10 years with the Smithsonian Institution as an exhibits specialist, fabricating a wide variety of exhibit display cases, diaoramas, and interactive wall panels. While living and working in the Baltimore and Washington D.C. area, he specialized in historic preservation work for older homes and churches. Entry vestibule doors with raised panels, fluted astragals and beveled glass have also become a specialty, using solid hardwoods such as white oak and mahogany. Bristol Woodworks' owner David King has more than 30 years of experience in the building trades. He spent 10 years with the Smithsonian Institution fabricating a wide variety of exhibit display cases, diaoramas, and interactive wall panels. He specializes in historic preservation work for older homes and churches. Vestibule doors with raised panels, fluted astragals and beveled glass have also become a specialty, using solid hardwoods such as white oak and mahogany. David designs and builds custom furniture, with influences from the early American period as well as Arts and Crafts. Fine details such as tapered legs, matching wood grains, and crisp mouldings are all featured in his furniture. 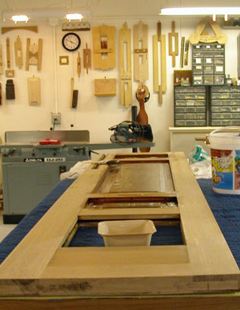 Antique furniture repair and restoration is another service offered by Bristol Woodworks. Loose chair runs, cracked table tops, damaged veneer, chipped carvings and distressed finishes can all be succcessfully addressed and treated. Metal and brass hardware can be cleaned, polished and lacquered. David can also restore your interioir wood surfaces after fire and smoke damage. Customer references are available upon request. Call or emaill for more information or to make an appointment to visit David's shop in Bristol, Vermont.